Campaign for the American Reader: Pg. 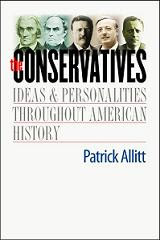 99: Patrick Allitt's "The Conservatives"
The current feature at the Page 99 Test: The Conservatives: Ideas and Personalities Throughout American History by Patrick Allitt. This lively book traces the development of American conservatism from Alexander Hamilton, John Adams, and Daniel Webster, through Abraham Lincoln, Teddy Roosevelt, and Herbert Hoover, to William F. Buckley, Jr., Ronald Reagan, and William Kristol. Conservatism has assumed a variety of forms, historian Patrick Allitt argues, because it has been chiefly reactive, responding to perceived threats and challenges at different moments in the nation’s history. While few Americans described themselves as conservatives before the 1930s, certain groups, beginning with the Federalists in the 1790s, can reasonably be thought of in that way. The book discusses changing ideas about what ought to be conserved, and why. Conservatives sometimes favored but at other times opposed a strong central government, sometimes criticized free-market capitalism but at other times supported it. Some denigrated democracy while others championed it. Core elements, however, have connected thinkers in a specifically American conservative tradition, in particular a skepticism about human equality and fears for the survival of civilization. Allitt brings the story of that tradition to the end of the twentieth century, examining how conservatives rose to dominance during the Cold War. Throughout the book he offers original insights into the connections between the development of conservatism and the larger history of the nation. Read an excerpt from The Conservatives and learn more about the book at the Yale University Press website. Patrick Allitt is Goodrich C. White Professor of History and Director of the Center for Teaching and Curriculum at Emory University. Author of six books, he is also the presenter of six lecture series with The Teaching Company on aspects of American and British history.